A small island in the Dodecanese, Symi is mostly known for its sea sponge and ship building industry. But behind its seemingly uneventful aspect, this tranquil and charming island is the perfect getaway for those in search of authentic holidays, quiet and beautiful corners and a low-key vibe. Here is what you should see and do in Symi. Arriving in Symi never fails to stun visitors. The welcoming and colorful island’s capital, though small, is actually divided into two parts. First the harbor, called Gialos, with its colorful neoclassical mansions welcomes anyone willing to discover it with open arms. Then Chorio, the more town-like part is located uphill. You will love strolling around the small streets and alleys and spotting church domes while sipping on a Greek coffee at the local kafenio. One of the island’s most iconic landmarks is undeniably the monastery of the Archangel Michael Panormitis, located on the southwest coast. Built in the 18th century, the imposing monastery with its impressive bell tower, is dedicated to the island’s patron saint, none other than the archangel Michael. Home to two small museums, the monastery is open for visits and monks sometimes even rent out cells for a small fee for those in search of alternative accommodation. Built in 1407 by the Knights of the Order of Saint John, who were also present on the island, just like in Rhodes, the Kastro overlooks Chorio and Gialos. Erected on the former acropolis, the castle’s original purpose was to be an expansion of a Byzantine fortress which was located on the same site and is partially still visible. Perfect to protect locals against potential invasions, the kastro fell at the hands of the Turks when they invaded the island in 1522. Located in Chorio, the Symi Archaeological Museum was founded in 1961. Housed in a traditional Symian house in the district of Agios Athanasios, known as the old part of the town, it features an archaeological collection of artefacts dating from the Classical, Hellenistic and Roman eras, a Byzantine collection, as well as a small collection of folklore, which includes traditional clothing, utensils, tools and even furniture. 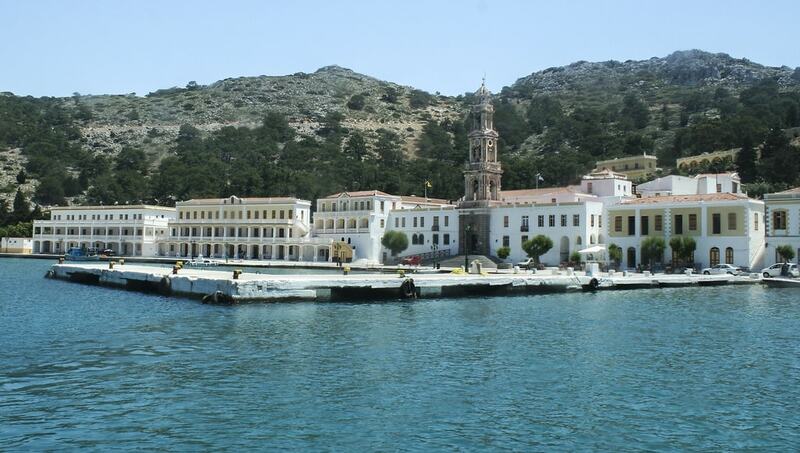 Every year, Symi hosts the Symi Festival, a cultural event held from July to September. The event includes musical and dance performances, theatrical plays and events, as well as the Symi International Film Festival, where anyone can watch movies screened outdoors for free for the duration of the event. Don’t let the size of Symi fool you, the event is quite huge and attracts a lot of visitors from Greece and beyond. You will quickly discover that despite being a mountainous island, Symi doesn’t lack fantastic beaches. However, several are off-the beaten track and can only be accessed via taxi boat. The island features sandy and pebbly beaches, as well as secluded coves. For example, Nimporio, Lapathos, Agia Marina, Agios Nikolaos, Nanou or Marathounta are definitely worth visiting for a fun beach session. If exploration is what you’re after, then you’ll also find many beaches on the neighboring islets of Nimos, Agia Marina or Agios Emilios. If you want to really see the island but don’t feel like hiring a moped, hiking is your best bet but a word of caution is necessary as there are hardly any hiking maps or proper markings on the roads. Some roads are actually pilgrim routes or simply old donkey trails. Just remember to pack some sunscreen, plenty of water and wear proper shoes. Some hikes may be demanding, but remember you will always be rewarded by spectacular views and/or a beautiful beach to rest at. You should also take advantage of the island’s close proximity to Rhodes and make an excursion to the Island of the Knights. You may have just enough time to visit Rhodes town, which is certainly more than enough for a day, as the town is filled with historical sights, cafés, shops and restaurants as well. We highly recommend you take the time to explore the Old Town, with its resolute medieval charm. Stroll around the cobbled streets admiring the medieval, Ottoman and Venetian architectural styles blending to make the fascinating background of this lively and history-rich city. The Palace of the Headmaster is a must for history buffs and a relaxing lunch by the marina in the New Town is definitely a great idea.